Le lundi 4 février 2019 à 11h, Oscar Sanchez-Macouzet (chercheur post-doctorant à la Tour du Valat) présentera en salle Jean-Paul Taris un séminaire en anglais intitulé « Social monogamy and the evolution of long-term partnerships in birds » ; l’accès est libre et sans inscription. The study of animal mating systems has been central to evolutionary biology over the past 50 years – particularly in the light of sexual conflict and the promiscuity between the sexes. Nevertheless, the ecology and evolution of social monogamy in humans and other animals continue to puzzle biologists and the general public to this day. Unusual for mammals, social monogamy has evolved multiple times and is the prevailing mating system among birds, where more than 90% of species breed with a single partner at a time. Psychologists and ornithologists have both suggested for decades that perhaps remaining with same partner could bring a variety of synergistic benefits such as increased familiarity and improved reproductive coordination between mates, but until recently formal mechanisms had rarely been explored. 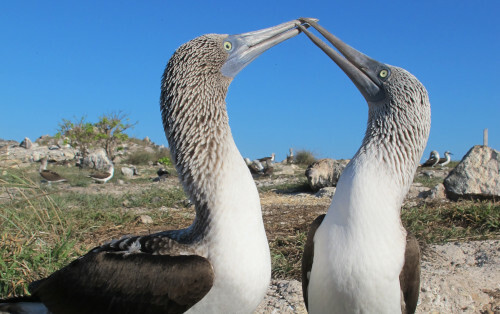 In this talk I will be presenting part of the doctoral research I conducted in Mexico, where I spent a few years studying the relationship between pair fidelity and the reproductive performance of the socially monogamous blue-footed booby, a long-lived seabird with pair bonds that can last for over a decade. By combining a remarkable 30-yr long-term dataset of individually marked breeders with detailed field observations, I was able to test key hypothesis about the costs and benefits of social fidelity and divorce. Overall, the results show multiple benefits of long-term fidelity, although an interplay of interests between males and females also revealed unsuspected costs. Ultimately, these results reveal the importance of setting our understanding of animal life-histories into broader ecological contexts such as the challenges animals face in a changing world.